Lakemonster is a highly charged and innovative rock band from Stony Brook, Long Island. Led by the multi-talented producer and songwriter Matt Aglietti, the band has successfully procured a distinct sound for themselves that is turning their newfound listeners into diehard followers. 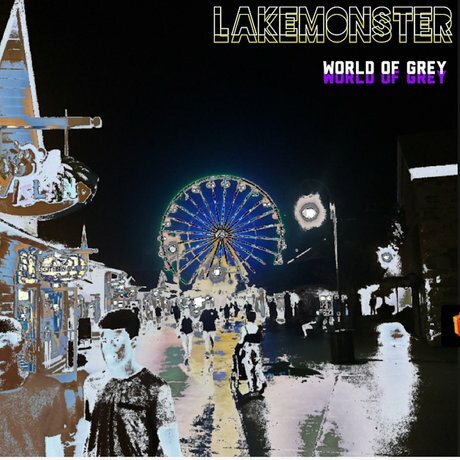 World of Grey, Lakemonster’s latest album, is a phenomenal offering that bears resemblance to Pink Floyd’s Dark Side of the Moon. World of Grey has a warm sound that it is easy to slip into. The album begins with a track. entitled, Introspection. This is probably one of the greatest album openers that I’ve heard in quite some time. Introspection puts the listener in the driver’s seat of their reflective emotions. The track begins with some hip drums, which leads to a dialogue between the bass and rhythm guitar that is completely tantalizing! The next song on the album, Rain, follows the mood of the first track but is a bit more intense because of the song’s enchanting vocals and dreamy theme. I found Rain to be one of my album favorites. Lofidelitynewscast, the third track on the album, introduces a brighter sound that qualifies its appearance on World of Grey as a somewhat experimental tune. Lofidelitynewscast displays a nice array of audible soundbites over a dreamy landscape. World of Grey has strong continuity as an album which is solidified with nice surprises like, Get to the Roof. Get to the Roof is one of those songs that will definitely keep you smiling because of its lyrical sarcasm. This track serves as a gatekeeper of sorts, heralding a controversial segment of the World of Grey album, which is evident by the succeeding songs Stand Still (Creative Control) and The Lukewarm (ft. Jim Jones). Lakemonster transitions back into a more calculable form of production in Eyes Closed and the hazy Janie’s Lawyer. which is two of the album’s fullest treasure chests. World of Grey provides an amazing social commentary with their title track of the same name, a reflective melody similar to the album’s opening. World of Grey is a lyrical sparkler, where the listener is encouraged not to fall into the traps of a thoughtless society. The Idea of You is a witty love song done in a slightly gothic-style production. It’s an incredible track that feels like you and that special someone are one of the last two people on earth. Dim Glow provides a great conclusion to this masterful work of musical prose. Upon listening to Dim Glow, I felt as if I had been learning how to walk on the clouds. Alas, World of Grey ends with a bonus version of The Idea of You (Original Recording). I find this version to be a unique and soulful whisper of Matt Aglietti’s genius. Bravo! The World of Grey album is a masterpiece of the ages and serves as a working philosophy and movement of survival through sound for a generation that is too much in the black and white of self-destruction.